The researchers say ‘the solar wind likely only had a very small direct effect on the amount of Mars atmosphere that has been lost over time.’ This makes them suspect that ‘a magnetic field is not as important in shielding a planet’s atmosphere as the planet’s gravity itself.’ It was always hard to see how the magnetic shield theory worked when Venus with its dense atmosphere has little magnetism. The Red Planet’s low gravity and lack of magnetic field makes its outermost atmosphere an easy target to be swept away by the solar wind, but new evidence from ESA’s Mars Express spacecraft shows that the Sun’s radiation may play a surprising role in its escape, reports Phys.org. Why the atmospheres of the rocky planets in the inner solar system evolved so differently over 4.6 billion years is key to understanding what makes a planet habitable. While Earth is a life-rich water-world, our smaller neighbour Mars lost much of its atmosphere early in its history, transforming from a warm and wet environment to the cold and arid plains that we observe today. By contrast, Earth’s other neighbour Venus, which although inhospitable today is comparable in size to our own planet, and has a dense atmosphere. One way that is often thought to help protect a planet’s atmosphere is through an internally generated magnetic field, such as at Earth. The magnetic field deflects charged particles of the solar wind as they stream away from the Sun, carving out a protective ‘bubble’ – the magnetosphere – around the planet. At Mars and Venus, which don’t generate an internal magnetic field, the main obstacle to the solar wind is the upper atmosphere, or ionosphere. Just as on Earth, solar ultraviolet radiation separates electrons from the atoms and molecules in this region, creating a region of electrically charged – ionised – gas: the ionosphere. At Mars and Venus this ionised layer interacts directly with the solar wind and its magnetic field to create an induced magnetosphere, which acts to slow and divert the solar wind around the planet. For 14 years, ESA’s Mars Express has been looking at charged ions, such as oxygen and carbon dioxide, flowing out to space in order to better understand the rate at which the atmosphere is escaping the planet. The study has uncovered a surprising effect, with the Sun’s ultraviolet radiation playing a more important role than previously thought. 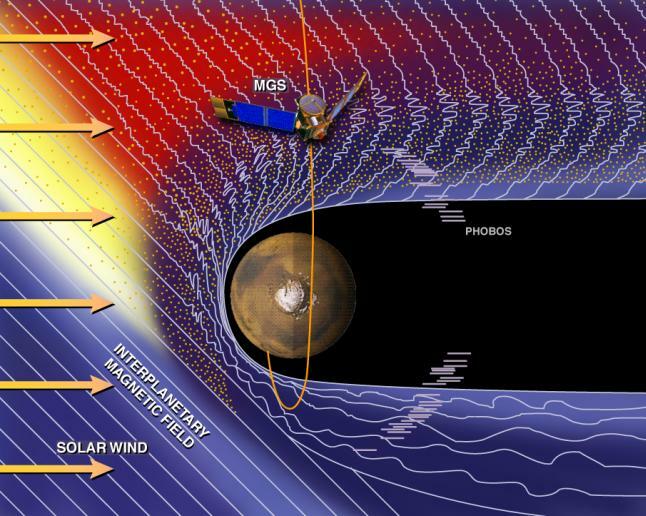 “We used to think that the ion escape occurs due to an effective transfer of the solar wind energy through the martian induced magnetic barrier to the ionosphere,” says Robin Ramstad of the Swedish Institute of Space Physics, and lead author of the Mars Express study. Debate is the problem, NOT the solution. Western “scientific” justice is a major charm offensive administered by academic magicians. A theory is compared to empirical data and when the data does not fit the theory, the theory is binned. “The ionising nature of the Sun’s radiation is found to produce more ions than can be removed by the solar wind. Although the increased ion production helps to shield the lower atmosphere from the energy carried by the solar wind, the heating of the electrons appears to be sufficient to drag along ions under all conditions, creating a ‘polar wind’. Mars’ weak gravity – about one third that of Earth’s – means the planet cannot hold on to these ions and they readily escape into space, regardless of the extra energy supplied by a strong solar wind. At Venus, where the gravity is similar to Earth’s, a lot more energy is required to strip the atmosphere in this way, and ions leaving the sunward side would likely fall back towards the planet on the lee-side unless they are accelerated further. “The ionosphere, a region in the upper atmosphere between around 50 km and 600 km from Earth. 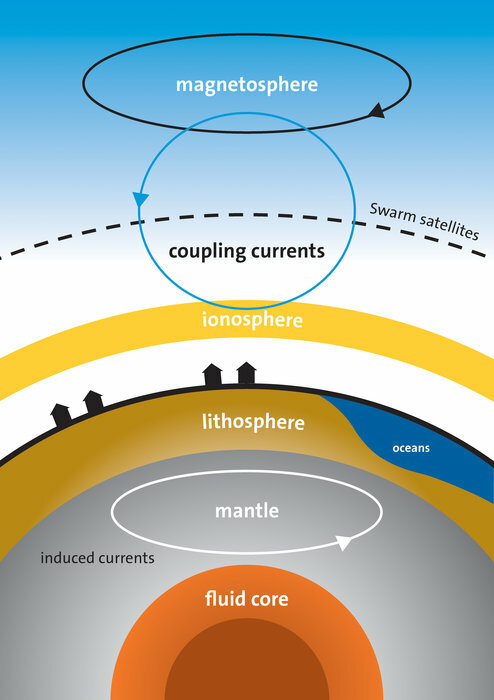 While there are indications that the density of the air in the lower ionosphere relates to geomagnetic activity, the underlying processes are not well understood. The ionosphere contains ionised atoms resulting from the effect of ultraviolet light from the Sun. Strong electric currents flow in the sunlit hemisphere, which is much more conductive than the night side. In a word, UV radiation and ionosphere can be more important to protect the atmosphere than it seems, by absorbing solar wind energy. The Global-scale Observations of the Limb and Disk, or GOLD, mission is designed to explore the nearest reaches of space. Capturing never-before-seen images of Earth’s upper atmosphere, GOLD explores in unprecedented detail our space environment — which is home to astronauts, radio signals used to guide airplanes and ships, as well as satellites that provide communications and GPS systems. “The Swedish-led ion mass analyser on Mars Express has been measuring the ion escape from Mars since 2004. 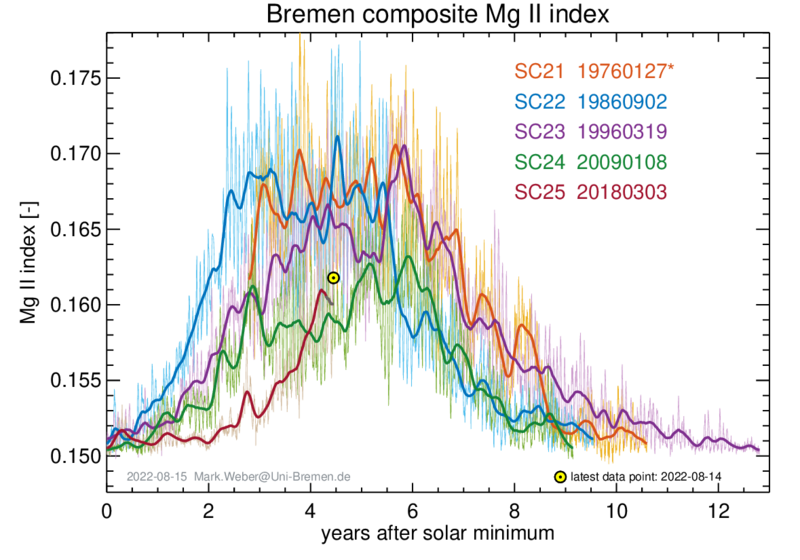 In his research, Robin Ramstad has combined and compared measurements of the ion escape under varying solar wind conditions and levels of ionizing solar radiation, so-called extreme ultraviolet (EUV) radiation. The results show that the solar wind has a comparatively small effect on the ion escape rate, which instead mainly depends on the EUV radiation. This has a large effect on estimations of the total amount of atmosphere that has escaped to space. Bitter@twisted says: “A theory is compared to empirical data and when the data does not fit the theory, the theory is binned.” That is not the standard procedure. It is ‘protect the dogma and ignore the empirical’. It could be that Venus is losing its atmosphere very quickly because of its high surface temperature and being closer to the Sun than the Earth. Both Mars and Venus have a high percentage of CO2 in there atmosphere which may indicate a higher rate of loss of lighter elements in the atmosphere. I wonder if Venus will eventually look like Mars. There is no empirical evidence that Mars ever had more of an atmosphere or for it’s warm wet past. Research published in June 2010 mapped 40,000 river valleys on Mars, roughly quadrupling the number of river valleys that had previously been identified. A very strong drop in solar ultraviolet radiation is visible. This is due to very low sunspot activity (weak flares). Yeah, I’m not buying the whole gravity explanation either. In geology, CO2 becomes carbonate. N2 becomes nitrates. O2 becomes oxides. H2O becomes hydrates. Atmosphere “leaves” by becoming rock. The Earth has more atmosphere than Mars as our nuclear core has not run out of fuel to power our volcanic processes that ‘de-gas’ those rock types above. Carbonates liberate CO2 into lava. Oxides get reduced. Water of hydration boiled out. Nitrates broken down too. When our volcanic activity stops (likely in this Billion years) we’ll start to look like Mars too as all our gasses and liquids get turned to various kinds of rocks.